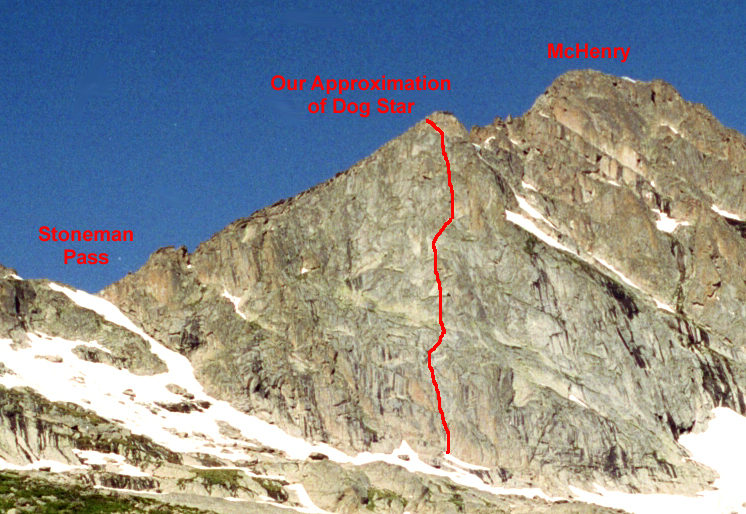 Three years before, in the Summer of 2002, Brian and I used the Stone Man Pass to scramble out of Glacier Gorge in RMNP on our way to the Double Crown of Chiefs Head and Mount Alice. 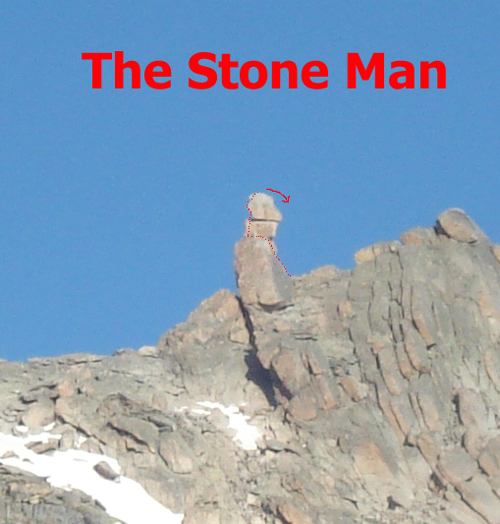 While hiking past the famous Stone Man, Brian, out of the blue, speculated on the difficulty of climbing the Stone Man pinnacle. While perhaps admitting to a lack of imagination, the question caught me off-guard to the extent that would musing over what marmots think about when not raiding unattended backpacks. I mean, who in their right mind would hike 6 miles each way and ascend 3,200 feet of elevation gain in order to do a 40-foot rock climb? Still, I did take a quick look. My judgment was it looked upper 5th class if it went, and it might not go; and no guarantees about getting down, either. Brian figured it was easy. Whatever. I put the notion out of my mind in the years since; Brian did not. In August of 2005, as Brian and I were going through our weekly “what are we going to do this weekend” exercise, Brian suggested we finally go see about climbing the Stone Man. The implication was that it’s been next on his/our list for some time. In some situations, this call would require an official/judicial ruling. But, our adventuring partnership is based on a choose-and-let-choose philosophy, meaning that when one of us really wants to do something, the other will generally agree. And since I didn’t have a better idea, Project Stone Man was a go. 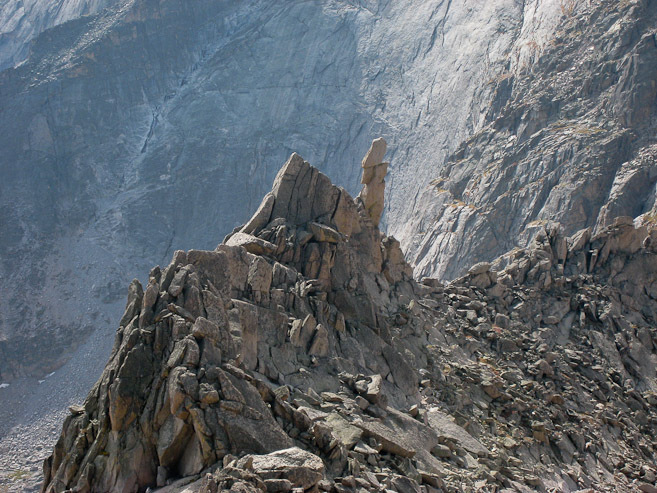 The plan was to hike 5 miles to reach Black Lake, scramble 1800 feet from Black Lake to reach the top of Stone Man pass, and then figure out a way to climb 40 feet of technical rock climbing to stand atop the Stone Man. Whoo Hoo! Well, it would at least be a good hike into beautiful terrain; no doubt a better day than that of 99% of the population. We started hiking right at 6am and made okay time reaching Black Lake at 8:00am; 2.5 mph at 288 feet per mile is 720 feet of altitude gain per hour while covering 5 miles — good enough while carrying rock gear. 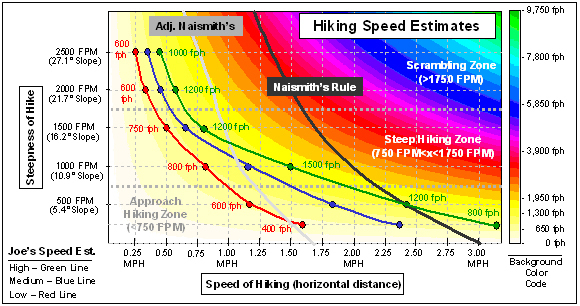 (See hiking pace discussion). 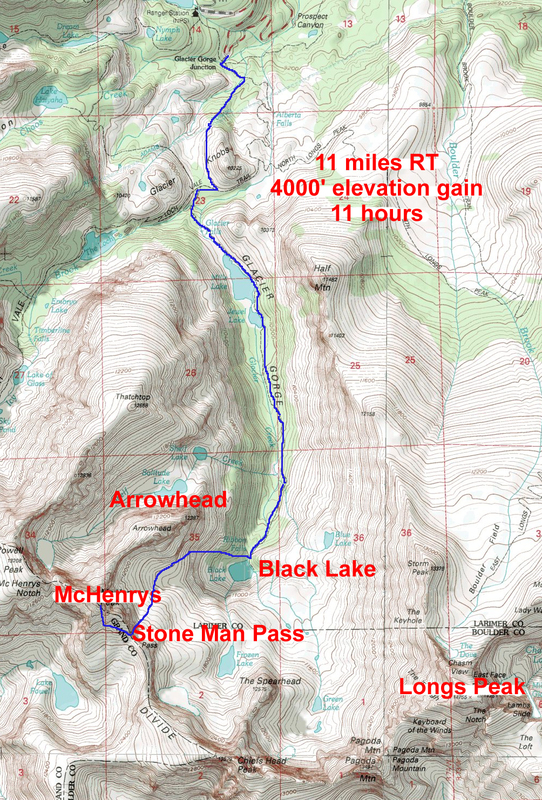 After a short water break, we left Black Lake for the shortcut to Stone Man Pass heading west beneath Arrowhead. 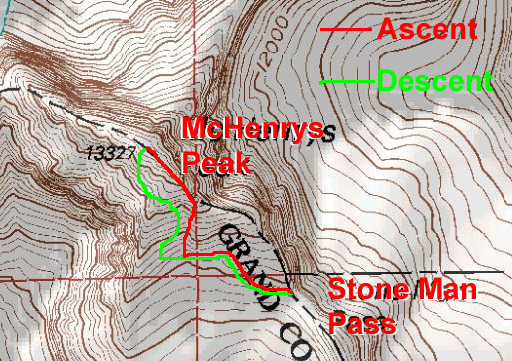 After a lengthy scramble up the steep grass and cliffy slope, we reached the bench above Black Lake; we then turned south to head underneath McHenry toward Stone Man Pass. We reached the top of Stone Man pass around 10:00am. After a short break, we began our exploration of the base of the Stone Man, looking for a probable line of attack. We started on the ridgeline and started going around the Stone Man counter-clockwise. In my eyes, it still looked hard. 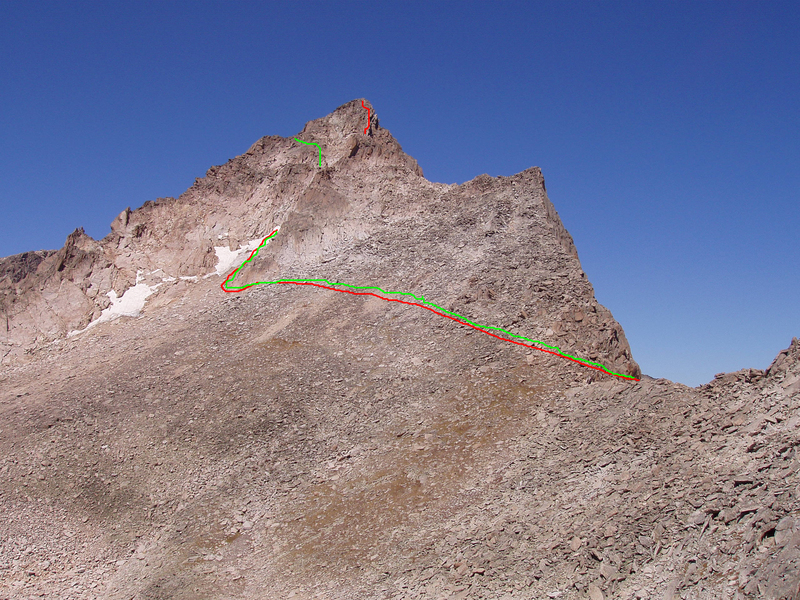 Once we made it around the the north face, we found a probable line…at least a line that would go to within 5 feet of the top. Brian said he’d do it; he grabbed the rack and started up. It turned out to be only a 20-foot climb, so I didn’t bother to get comfortable. After 10 minutes, Brian yelled back down that it went. He said there was a single tricky, hard to protect move; then he went for it. And he was on top. He yelled down that it would take a bit of time to set up a belay. I didn’t know what to make of that but did what I could do; I waited. 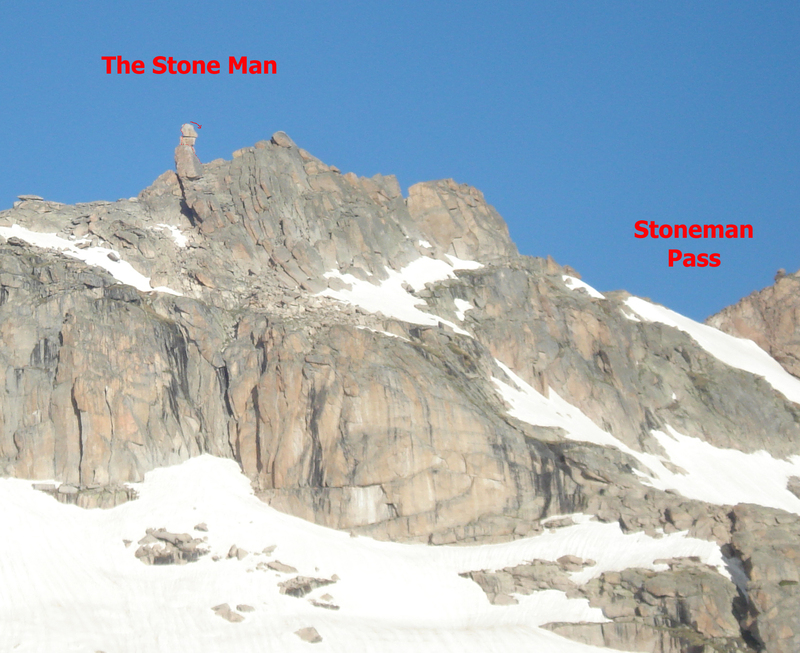 I watched from below as Brian flipped the cordellette a few times to get it all the way around the Stone Man’s head. Then he yelled out that I was on belay. I followed his route, admiring the quality of the few moves it required. And then I was standing below the summit and studying the exposed move that Brian had made to accomplish his (our) goal. I repeated it, and then I was on the summit as well. 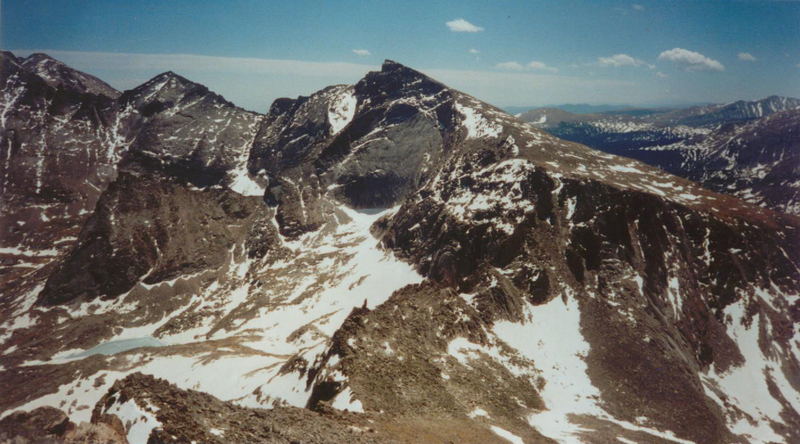 It was an admirably exposed summit, but not a good place to spend the rest of your life. When I looked around, I noticed that the cordellette was the only anchor. Brian informed me that it was the only thing he could find for protection, and asked me if it was okay that we sacrificed it (the cordellette was mine). Well, I did want to go home eventually, so I complied. We rappelled back to the base and started back down. 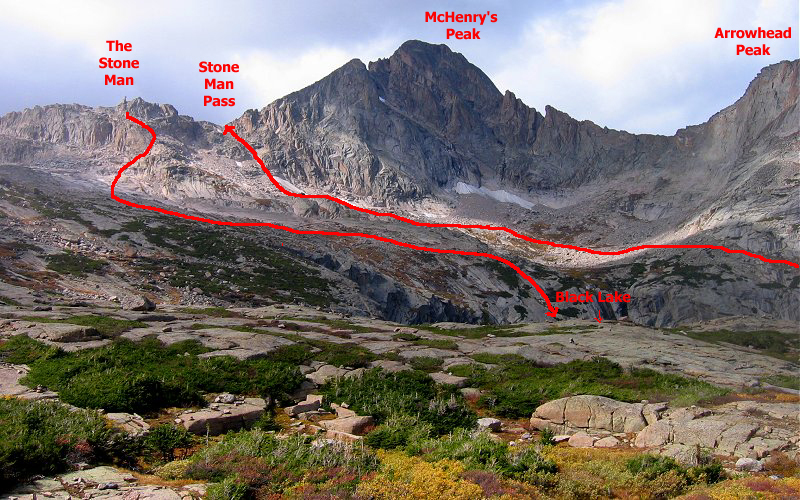 We started following cairns down the east slope (toward Spearhead & Longs), simply curious to see if the path would lead us back to the basin below McHenrys. It was a winding route, but far superior to the nasty Stoneman Pass route. It worked! Since we were in an adventurous mood, I suggested we try the waterfall descent route Brian had mentioned as a possibility some years earlier. 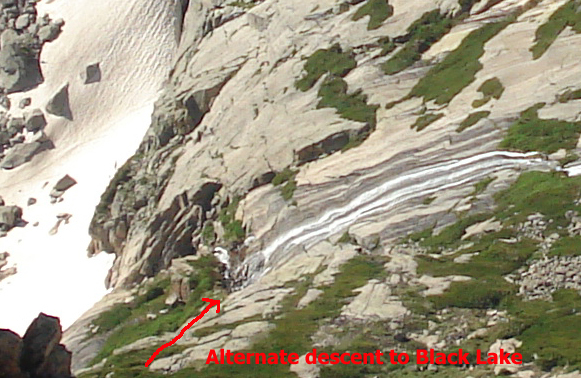 Brian was game, and we angled directly for Black Lake and the top of its major waterfall. The descent was a bit more dramatic than I expected. 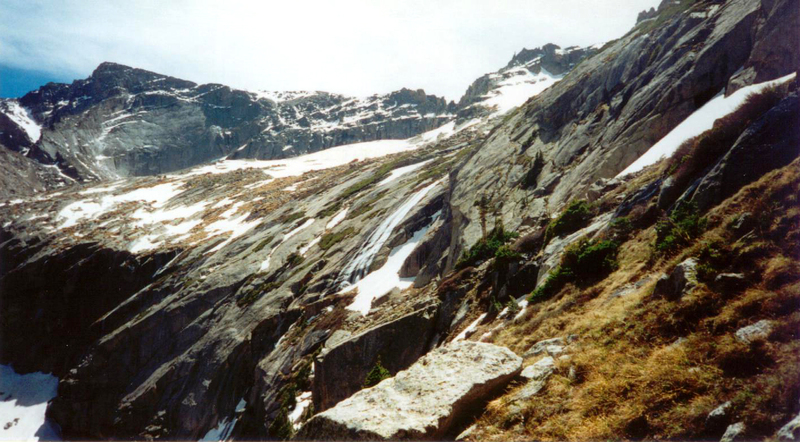 The climb down into the waterfall notch was easy enough; but once into the notch, the passage got thin and steep. 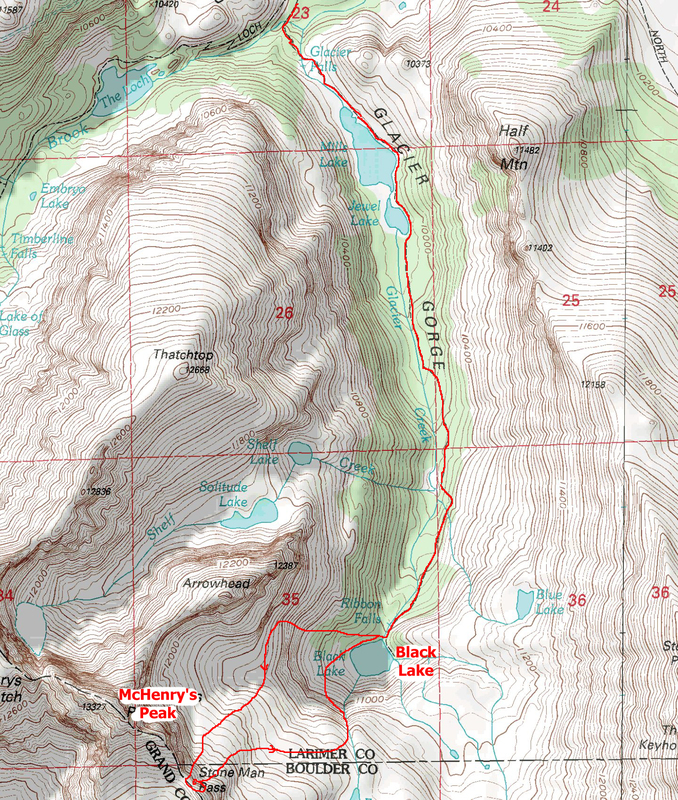 It was worth doing, but not superior to the scramble up to or down from the bench above and west of Black Lake. A short scramble led us back to Black Lake and another short rest, and then 5 miles back to the car for the 1 hour drive back to Boulder. Brian insisted on replacing my cordelette and so we drove to Neptunes to buy 30 feet of 6mm cord. Despite my early lack of enthusiasm, The Stone Man Project turned out to be a worthy adventure. My only regret is our having to leave a cord where it can be seen. I hope the sun and weather beat that cord down quickly.